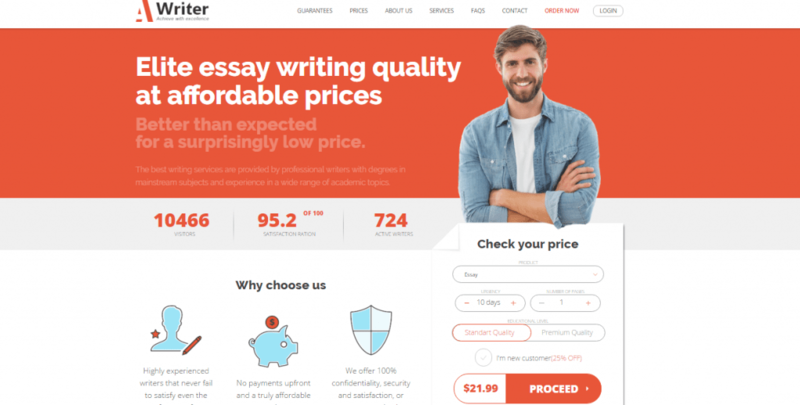 Is Essay-Company.com truly a ‘writing service that exceeds your expectations’? It is most certainly a legit writing service, but is this your best choice for a regular content provider? We looked into their website and found interesting information about the services they offer, which is why we decided to research a bit and share our experience with those interested in purchasing from this company. You would have to open the ordering form and add your personal information if you want to check what services this company offers, which is a huge disadvantage and a loss of time if you end up failing to find your paper in the list. To make things easier, we have done this for you and can inform you that essay-company.com does offer a wide range of writing services, at least the most commonly requested papers by students of all academic levels. Prices at Essay-Company.com vary depending on academic level, urgency and number of pages. They are not based on the type of paper, but separated into four major categories: writing from scratch, editing and proofreading, multiple choice questions and problem solving. Generally speaking, the pricing here is not high and can be considered fair when compared to that of other services on the Web. The cheapest price for writing services is $10 page for an undergraduate level paper with a deadline of 14 days, while the highest price is $197 per page for admission help with a deadline of 3 hours. Except for the statement ‘exclusive guarantees and discounts’, there is nothing about a discount or a loyalty program on the official website of this company. Seeing that they do not even have a live chat, we could not get the necessary information regarding their discount policy, which made us more and more disappointed by the information presented on the website as we moved forward with this review. Even though the company said they offer discounts, they provided us with no discount whatsoever. However, the affordable prices convinced us to order a dissertation chapter from the service. Unfortunately, the quality of paper delivered by this company was unsatisfactory. The writer failed to follow our requirements and, even though he delivered the paper on time, it was not a good fit to the remaining of the dissertation. As for customer support, the website lists a phone number and a live chat as methods of communication. However, you will find that they do not have a live chat, which means that the phone number is your only way to contact the service. After two failed attempts, we gave up on contacting them altogether. To conclude, essay-company.com is not a trustworthy service. Their website is a disaster since it is full of false information and you will have to spend hours looking for important information. Also, they do not have a working method for contact. Furthermore, the paper we got from the service was relatively good, but not as high quality as one would expect considering that essay-company.com does not even offer a discount to reduce the original pricing.